A call to Axel Douque at Ocean Independence in Switzerland brings more details of his latest listing, a new 75m project from Rossinavi. Naval architecture is by Arrabito Naval Architects with an exterior design by the talented Enrico Gobbi at Team 4 Design and she will be built to Lloyds class and MCA compliant. Accommodation will be for 14 guests in seven cabins, including a private owner’s deck. Axel says the layout can be altered within the parameters of the engineering platform and the interior is open to the choice of the buyer. 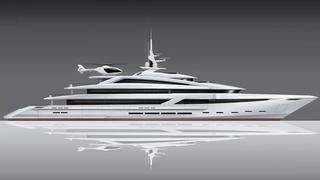 Other features include a touch and go helipad and a plunge pool on the stern. The project can be delivered 38 months from signature of contract and is asking €69.5 million.